Foreign Minister Khaled Alyemany met on Wednesday with Swedish Special Envoy to Middle East and North Africa (MENA) Peter Semneby The discussions focused on the latest developments relating to the implementation of Sweden Agreement about Hodeidah, prisoner-exchange and Taiz. 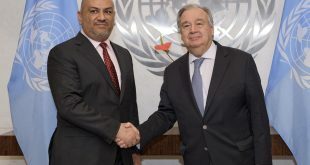 Alyemany detailed Semneby about the legitimate government’s commitment to implement Stockholm’s Agreement and President Hadi’s vision of the solution to the Yemeni crisis. He underscored the importance of mounting pressure by International Community (IC) on the Houthi militia to save Stockholm’s Agreement and put it in place. 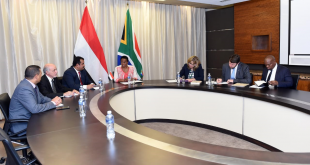 The Foreign Minister has made clear that the Yemeni government doesn’t make failure of Stockholm’s Agreement as an option because that won’t help building confidence as a perquisite for peace building process. 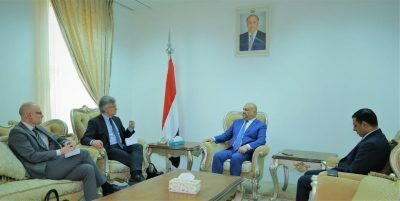 The Swedish Envoy reiterated his country’s interest in following up the implementation of Sweden Agreement that is urgently needed to pave way for comprehensive political solution and help Yemen manage the humanitarian crisis.